Many industry observers were surprised in February 2013 when Windstar Cruises announced the purchase of three small luxury ships, primarily because the upscale niche line was known for operating ships with billowing white sails and a jaunty nautical ambiance. But as Windstar continued to grow - blossoming under a new, deep-pocketed owner - it needed more capacity, says CEO Hans Birkholz. So Windstar bought the three 212-passenger vessels from Seabourn. The first of those ships, the Star Pride, was christened May 5 in Barcelona after undergoing a major renovation. 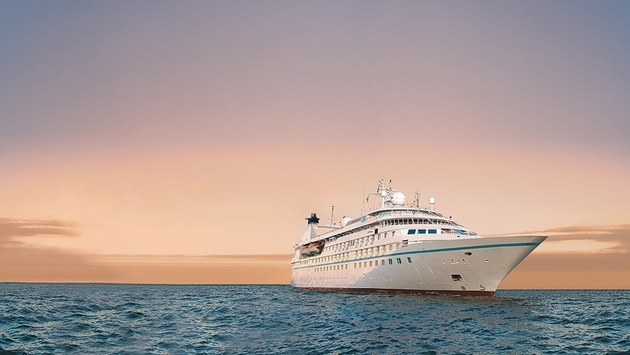 The next two sister ships, Star Legend and Star Breeze, will join the Windstar fleet in May 2015. Each is 10,000 gross tons with 106 suites and six passenger decks. The Star Pride is Windstar’s first ship in 16 years - since the 310-passenger Wind Surf joined the fleet. And therein lies the key branding messages. Although the three new ships don’t have sails - the hallmark of Windstar’s other three motor-sail yachts - the feeling passengers have onboard is the same and the public spaces share names and décor, Birkholz said. Windstar calls its new vessels “power yachts,” and Birkholz says all three will have a similar interior appearance, atmosphere and signature experiences such as a deck barbecue gala, an open bridge experience and the sail-away party. The transformation and growth of Windstar is due to its new parent company, Xanterra Parks & Resorts, which is known primarily for operating national park lodges but also owns tour companies Austin Adventures, Country Walkers and VBT Bicycling and Walking Vacations. Xanterra is owned by Denver-based billionaire Philip Anschutz, who also owns AEG and professional sports teams as well as venues such as the Staples Center in Los Angeles. After an $18 million renovation of the three motor-sail yachts was completed in late 2012, Xanterra quickly followed up with the purchase of the three Seabourn ships. PHOTO: The marina opens on calm seas to let guests play in the water. The onboard atmosphere is “casually elegant” with no formal nights and no jacket or tie required. The ship requests that shorts, T-shirts, jeans, flip-flops and tennis shoes are not worn in the main dining room or during cocktail time and evenings in the Lounge and Compass Rose. Here is a summary of the Star Pride’s features. The 106 suites all face outside and many have French balconies, which were installed a number of years ago by Seabourn. They all received new carpeting, drapes, furnishings and headboards. The color scheme is tan and gold with touches of bright nautical blue. The majority of the suites, 64, are Ocean View Suites that measure a roomy 277 square feet and have picture windows - plenty of space for the queen-size bed (convertible to twins), a sofa, two cushioned chairs, a small table, a built-in cabinet with a minibar, a desk and a walk-in closet. The bathroom has a granite countertop, a full-size tub and a shower. Four of these staterooms are modified to be accessible for wheelchairs. All suites include an LCD flat-screen television, a DVD/CD player, a personal safe, a minibar with complimentary soft drinks, an international direct-dial phone, wireless Internet access (fee-based), Bose SoundDock speakers, L’Occitane toiletries, a hairdryer, magnifying mirrors, Euro-Top mattresses and luxury bedding, Egyptian cotton towels, waffle-weave robes, slippers, an alarm clock, fresh fruit and flowers. The 36 Balcony Suites are similar but feature French-style style balconies, which allow fresh air in but aren’t large enough to sit on. 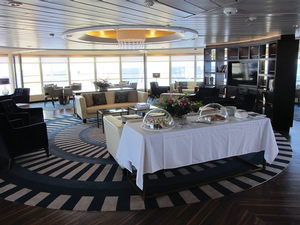 There are four Owner’s Suites on Deck 6 with second bathrooms, a television in the bedroom and a separate sitting area. The two forward Owner’s Suites measure 575 square feet and have forward-facing balconies. The two mid-ship Owner’s Suites are slightly smaller at 520 square feet and also have balconies. Two 400-square-foot Classic Suites are forward-facing with French doors opening onto a private veranda. 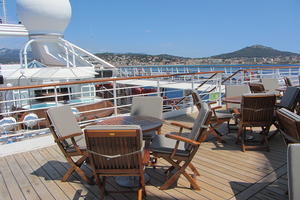 Windstar offers an open-seating program in AmphorA, the main restaurant, which features an international menu. Most guests rave about the food, which includes some dishes made with fresh local ingredients. The casual eatery, Veranda, serves a breakfast and lunch buffet with indoor and outdoor seating. In the evening, it is transformed into Candles, an al fresco dinner alternative. Reservations are required, however, and generally limited to one time per suite per cruise. PHOTO: The Yacht Club is a comfortable observation lounge with a nautical ambiance. The Yacht Club (formerly known as the Constellation Lounge on Seabourn) is high atop the ship on Deck 8, forward. Although not a formal restaurant, the round room serves coffee, fruit and a variety of fresh sandwiches throughout the day. Room service is also available around the clock. All soft drinks are included, and Windstar offers an alcoholic beverage package as part of its “Luxury As You Like It” sensibility - you select the options you want. “Some people don’t like to pay for other people’s bar bill,” as Birkholz puts it. The drinks package is $108 per suite, per day, plus a 15 percent service charge. It must be taken for the entire cruise. The aforementioned Yacht Club is a comfortable spot for admiring the views, relaxing with a good book or getting a coffee or a quick bite to eat. It has a nautical ambiance with wooden floors and bookcases and a big round carpet reminiscent of a compass. Compass Rose, the former Club Lounge, is the place for after-dinner drinks and live music nightly. It received new contemporary furnishings, a wood floor, plantation shutters and comfortable chairs and bar stools. The Lounge is another gathering place with a band or other performers in the evenings. Entertainment onboard includes a pianist in the lounge or local performers. “You won’t see Blue Man Group when you come on Windstar,” Birkholz says. PHOTO: The top-deck Star Bar offers sun and some shade and a place to view the scenery. The outdoor top-deck Star Bar (formerly Sky Bar) has teak tables and cushioned chairs and a curved bar sheltered from the sun. The Star Pride also has an aft watersports platform that lowers down into the water when seas are calm and lets guests swim, kayak or windsurf right from the ship. So who is the Windstar guest? The company says that its guests are primarily affluent couples ages 40 to 70, often professionals or business owners. 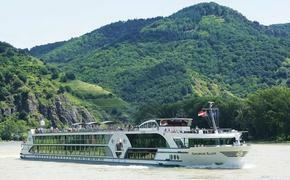 They are well-educated, experienced cruisers, discerning world travelers, members of country clubs and art associations and are interested in the arts, environmental issues, food and wine. This summer and fall, the Star Pride operates seven- to nine-day voyages in the Mediterranean and Aegean seas, to and from ports such as Athens, Istanbul, Venice, Rome and Barcelona. On Oct. 30, the ship heads for Asia, for the 18-day Wonders of Arabia voyage from Athens to Dubai and the 15-day Nov. 17 cruise to Singapore. Starting in December, the Star Pride will operate 10- and 14-day cruises exploring Hong Kong, Singapore, Vietnam, Thailand and Malaysia. 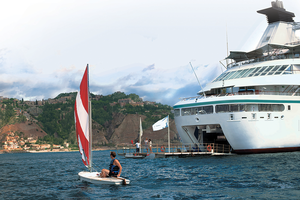 For more information, visit www.windstarcruises.com or call 866-766-3873.